The migrant rescue charity Sea-Watch has warned the EU to “reflect” on its planned training of Libyan coastguards following what it insists was a coastguard attack last week on one of its operations.This led to the drowning of up to 20 migrants from around 160 on an inflatable raft. Navy spokesman Colonel Ayyub Gassem has denied that any coastguard vessel was involved. Pictures published by Sea-Watch show the intruding vessel sporting a decal on the rear superstructure . 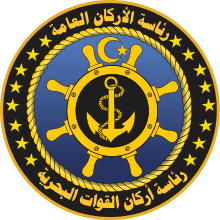 It does not appear to be the normal design for the Libyan navy seal. Sea-Watch asserts that the attack was a blatant violation of international law, created danger and mass panic, and that the coastguard failed to carry out its search and rescue duty. “In light of this incident, ” says Sea-Watch, “we demand the EU to reflect upon the planned training of the Libyan Coastguard, when this includes self-styled authorities operating in a manner that represents a blatant violation of international maritime and human rights law”. Sea-Watch insists that the incident involved a Libyan coastguard patrol boat with some 15 armed men in combat fatigues including one manning a deck-mounted machine gun. But it says that no shots were fired. Four days ago the Libyan craft approached the rescue site at high speed creating a wake as two Sea-Watch RIBs were about to distribute life jackets to the migrants. The charity boats pulled back to the shelter of their mother vessel. Communications by wireless and megaphone from the Sea-Watch were hampered by the fact that no one on the rescue boat spoke Arabic. After the Libyan craft had backed up to the migrant boat, Sea-Watch said that one of the Libyans boarded it from the prow forcing his way through the passengers, kicking and stepping over people. He reached the outboard motor, which he used to bring the inflatable alongside his vessel. The charity claimed that this man was striking migrants with an object that could not be identified. Sea-Watch has published a detailed report into the incident four days ago, which includes the rescue ship Sea-Watch 2’s radio and chart logs. These appear to show that at the time of the incident, the vessel and the estimated 130 migrants it was trying to rescue from an outboard-powered grey inflatable were 14.5 nautical miles off the coast. Worldwide, territorial waters are normally considered to extend for 12 nautical miles. 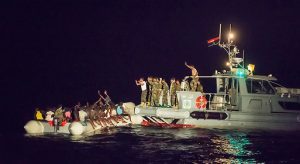 “The general attitude of the crew aboard the Libyan Coastguard vessel is non collaborative and rather rough” the Sea-Watch 2 log recorded, continuing “The Libyan Coastguard shouts the words ‘migrants’, then repeatedly ‘Out, out!’, accompanied by hand gesture, easily interpretable as a request to leave and move out of the rescue area”. Guided by controllers in Rome who had picked up a distress signal from the migrants, the Sea-Watch 2 had reached the migrants at 2.30 am and the Libyan vessel appeared some 20 minutes later. The migrants panicked when their craft was moved alongside the Libyan vessel. One leapt into the water and was picked up by a rescue RIB. Since the news of the incident broke, there has been speculation that the Libyans were trying to recover the outboard motor. However a Sea-Watch member has told the Libya Herald that the engine was not taken. But it appeared that one of the inflatable tubes began to deflate and the craft foundered, throwing everyone into the water. At this point, the charity says the Libyan vessel left the scene at high speed with all its lights turned off. It was watched on the rescue ship’s radar to make sure it did not return. The Sea-Watch 2 then resumed the rescue and pulled 124 from the water as well as recovering four bodies. Crew members thought that as many as 16 more migrants were unaccounted for. The vessel searched the area until after 5 am and then withdrew with the survivors.